A decade from now, city transit agencies in California will no longer be able to buy a bus that runs on diesel or natural gas. The California Air Resources Board, the state’s clean air agency, just voted on a new rule that will require cities to shift to 100% electric buses over time. It’s happening at a time when many California cities are already starting to buy new electric buses; more than 100 zero-emissions buses are already on roads in the state, and hundreds more are on order. But the new rule will make things move faster. The rule applies to all transit buses; school buses and privately operated buses aren’t covered. Starting in 2023, large transit agencies will need to buy electric buses 25% of the time (small agencies have a few extra years for this goal), then 50% by 2026. By 2029, agencies will no longer be allowed to buy a bus that isn’t electric. It’s a change that took several years of work to make happen. “The natural gas industry tried to derail this legislation,” says Martinez. “They have a lot to lose, because public transit buses are a pretty core part of their business. This rule threatens them.” Some transit agencies also pushed back. But regulators were persuaded by the ability of electric buses to help with California’s air pollution problem–Los Angeles, Bakersfield, and other cities in the state make up eight of the top 10 most polluted cities in the country–and help lower greenhouse gas emissions. 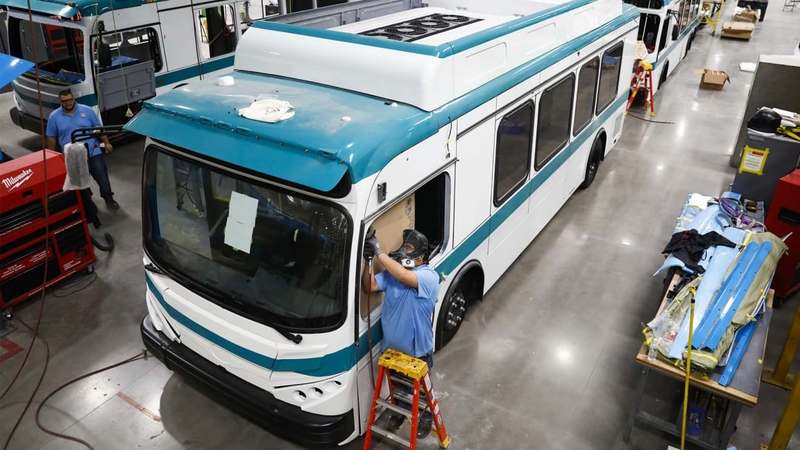 Some key players in the electric bus industry are based in California, such as Proterra, which recently secured a $155 round of investment led by Daimler. The company, led by a former Tesla executive, says that its buses are cheaper than diesel or natural gas over the lifetime of a bus. Some battery electric buses can travel hundreds of miles on a single charge of the battery. But the technology still needs to evolve even more–San Francisco’s transit agency, for example, says that it still needs more proof of the ability of electric buses to handle steep hills and heavy ridership (though electric buses using fuel cells already do operate on the East Bay’s similarly steep hills). In L.A., some electric buses have broken down. “Like with any technology, there’s work that needs to happen,” says Martinez. When L.A. originally shifted to natural gas buses, he says, the transit agency there had to take dozens off the road because of fires and diesel bus breakdowns don’t make the news. In general, electric bus tech is ready. California’s shift is actually happening far more slowly than in China, where heavy government subsidies are driving the transition. (In California, some support for electric buses is coming from the state’s gas tax and utility programs to help upgrade infrastructure for charging.) This year, the city of Shenzhen finished converting its entire fleet of 16,000 buses to electric. That’s more than the number of city buses in all of California.